Things have been running at an all time insane pace over here at Old Town Home lately. We're in the middle of our big master bathroom renovation, Alex has been working to repair the shoddy attic ductwork and insulation we inherited with the house, we've been working tirelessly to keep our flowers and vegetables alive during this heat wave, and the long hours at our day jobs have been making it difficult to get everything done in a timely fashion. 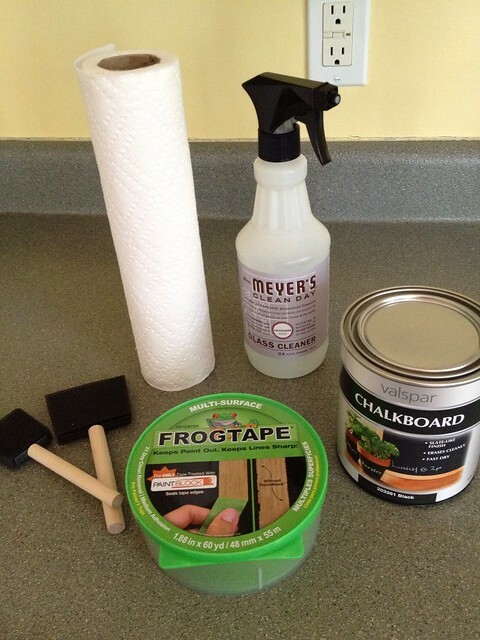 So when I read that a few of my favorite blogs are once again doing a Pinterest Challenge, I brushed it off. We certainly don't have time to add another project to our frenzied weekend itinerary! But as the weekend wore on, I couldn't stop thinking about the Pinterest Challenge, wondering if there was a small project I might be able to tackle in just an hour or two. 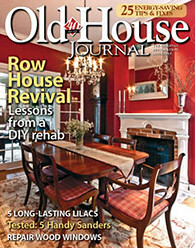 Something that could be a fun break from the overwhelming project that is our bathroom renovation. Something that I could officially check off as done, and begin to appreciate immediately. I made a deal with myself. I decided I would take on the Pinterest Challenge if, and only if, it was an idea I had previously pinned, I already had all the supplies on hand and therefore wouldn't have to run to the store, and it would only take an hour or two. 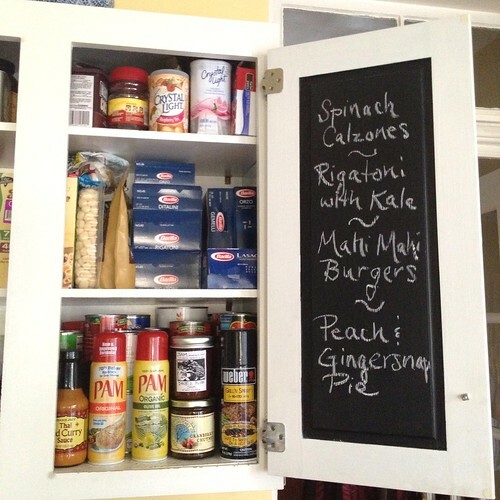 After perusing my pins, I landed on my "Great Idea" board and decided upon the idea of creating a chalkboard space for my kitchen to help with menu planning and outstanding errands. When I do my grocery shopping, I add sale items to my list first, then I determine 2-3 recipes I'll make that week and fill in the ingredients I'm missing. Lastly, we round it out with other items we're out of or purchase on a weekly basis (bananas for instance). After making my list, I jot down the recipes for the week on a scrap of paper or post it note and stick it to the side of our refrigerator. This idea was born from my frustration with my better half. Although I do most of the cooking and tend to get home from work first, on the off occasion he beats me home it would annoy me that he claimed he "would have started dinner but didn't know what we had to make." 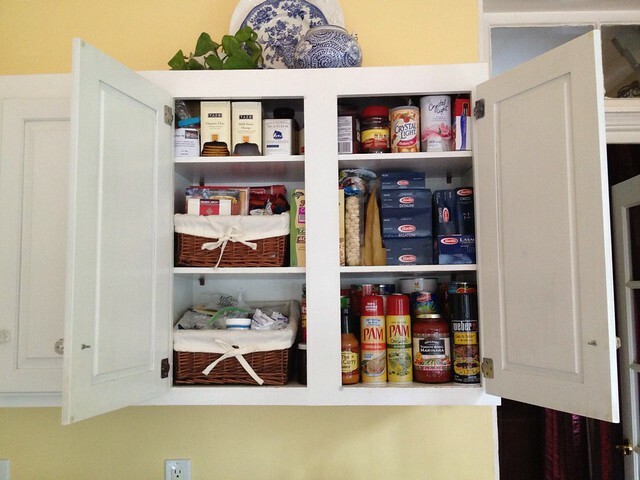 My solution: post the week's recipes in a visible location for all to see. 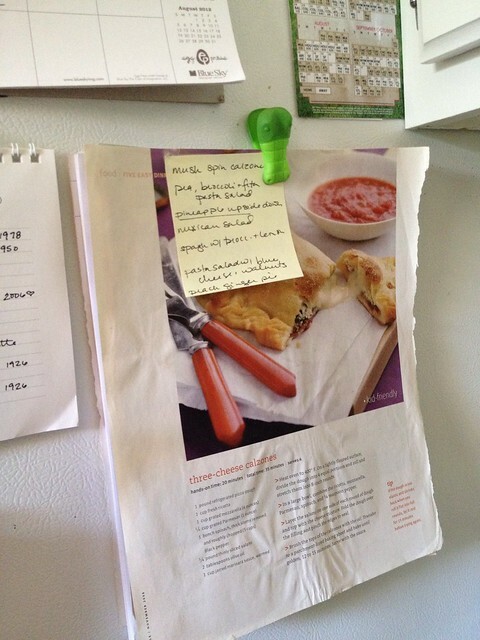 Although we both find this system useful, it doesn't always look so nice having recipe clippings and post it notes all over your fridge. That's where this week's Pinterest Challenge comes in. 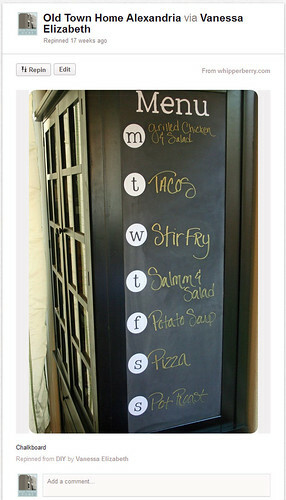 I had long been admiring the menu chalkboard project idea from Heather of WhipperBerry (and her tutorial on creating a chalkboard menu). I loved the concept, but wanted to tweak it a bit. 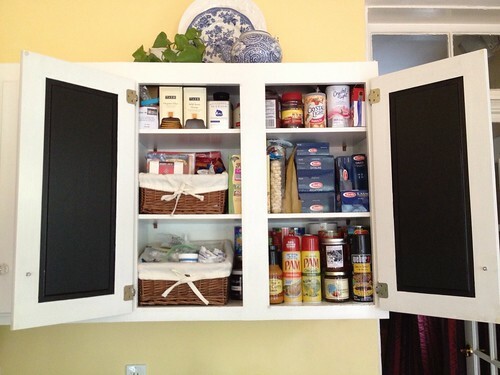 First of all, I wanted to be able to conceal my chalkboard space so it didn't add more visual clutter to my kitchen. If I had a true pantry, I'd probably want to use the back of my pantry door for this, but given I use an upper cabinet as my pantry, I settled on painting the inside of these cabinet doors. After all, this isn't the first time we've painted our cabinets, so I felt fine trying this, even if it didn't turn out the way I wanted it to. We already had all of these items on hand, and had nearly a full quart of chalkboard paint. The chalkboard paint was leftover from the labels I created for my wire storage baskets when we reworked our basement stairwell into a coat closet. In a matter of minutes, I had these supplies gathered and was ready to begin. First, Alex and I wiped down the interior doors to clean away any grime, grease, or residue that can accumulate on kitchen surfaces. This is an important step before we started painting, otherwise the paint was likely to not adhere properly. Next up, we carefully taped off the area we wished to paint, making sure to firmly press down the tape along what will be our wet edge. 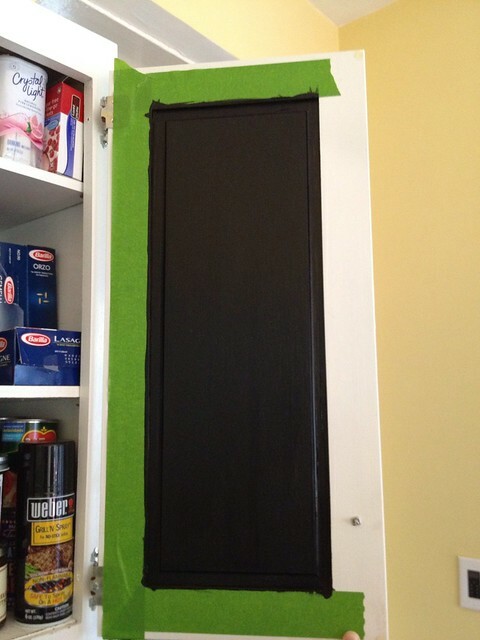 With our surface taped off, we applied the first of four coats of the chalkboard paint. 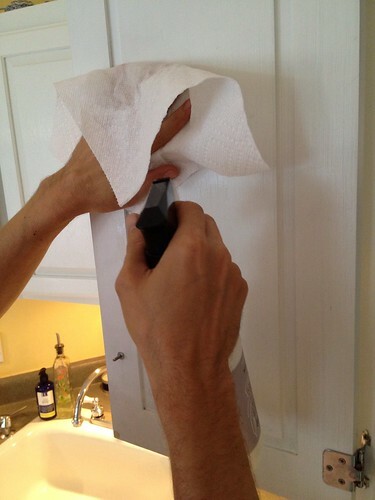 You can see from the photo below, this paint goes on very thin and streaky, so multiple coats were a must. After applying all coats of paint, we carefully peeled away the tape, revealing the outline of our new chalkboard areas. After giving the paint a full 24 hours to cure, we were ready to put these babies to use. Applying a little chalk allowed me to see the project in action and the potential this offered in keeping us just a little more organized. I'm going to use the left side as a way to remind myself of greeting cards or thank you notes I need to send, or gifts I need to purchase. The right hand side will now serve as our weekly menu board (this will ensure Alex has no excuse when it comes to preparing a meal or two). You could also use this as a place to list emergency phone numbers for babysitters (or in our case, pet sitters), schedules, or any other info that you tend to need often and in the kitchen. If you wanted to get really fancy, you could add categories, days of the week, or headers on each chalkboard in either paint or adhesive letters. For now, I'm going to leave it plain until I'm confident this is how I'll continue to use this space. And finally, to make this little project even more useful and fun, I ordered a set of chalk pencils to help make sure we have writing utensils on hand without the need for messy chalk sticks laying around. I saw these on a recent trip out to the Napa Valley and thought they were a great idea. Now that I have a functional chalkboard space in the kitchen, I felt I needed to pick up a nice multi color set. Life is better in pastels. Update: Ok, so we received the pencils that Alex ordered for me...they won't work. What Alex thought were chalkboard pencils in pastel colors, were actually pastel chalk pencils. Do you see the distinction? Yeah, these are chalk pencils an artist might use and are not for chalkboard writing. They do write, but you need warm soapy water to clean them off. Sorry if we led you astray. We're working on a new idea and hope to have a little more info on it next week. Oh well. Thanks to Young House Love, Centsational Girl, Bower Power, and Ten June for inspiring me to muster up the time and energy to complete this fun and useful project. That extra nudge was really what I needed! That's funny I did the same thing but on the Pantry doors we have been meaning to get up since January madeinmorningside.blogspot.co.uk/2012/07/summer-pinterest-challenge-2012.html. I love this! We need to do SOMETHING like this in our kitchen, because Mike does the same thing when he gets home first unless I text him during the day. I could also use some major reminding of when to mail things, haha. It was super easy, and I have high hopes for how functional it will be. 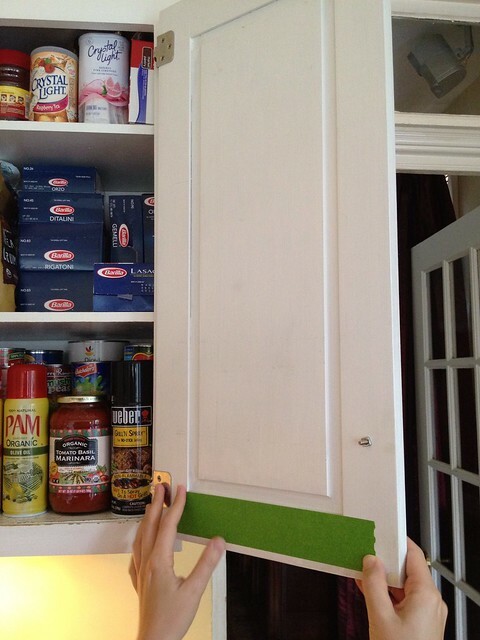 I'm also thinking about gluing a clip to the door for my weekly recipes to make it even more functional, and to hide the clutter that's on our fridge. Pretty! I've got a little 'schoolhouse' slate type chalkboard propped up in the kitchen that's supposed to be for menu planning, but I never use it because of the dust from the chalk on my hands. I'll be looking for the chalk pencils! Well, the pencils are a little bit of a fail. We'll give a little more info next week, but they definitely don't wipe off like we thought they would. 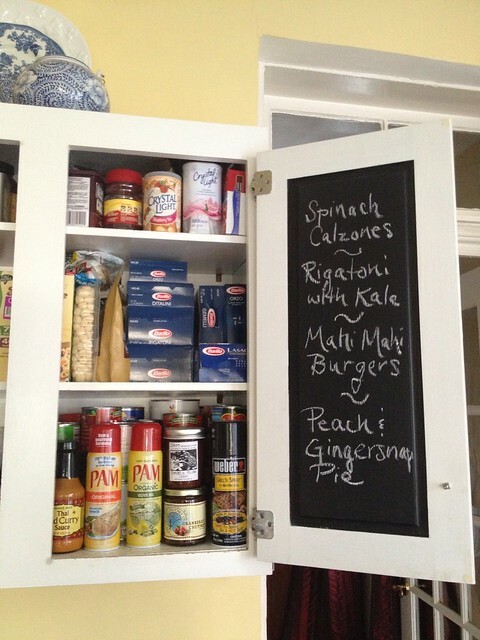 We did this on the inside of our pantry door and it is a lifesaver for grocery shopping. Though I think I need those chalk pencils! I'm super excited to give the chalk pencils a try. And I love that I can have different color options! Question: do you rewrite your grocery list before going to the store so you can take it with you? Or do you take a photo with your phone? I often wondered how people use it for a shopping list. This is so cute and handy! Love it. Nice job! Love it!!! I think I might also love the peach gingersnap pie. That turned out so cute! I'm totally getting those chalkboard pencils!! I did the same thing to our pantry cabinet doors a bit back (Pinterest inspired, of course! ;o) ) but, rather than chalkboard paint I used chalkboard contact paper - the project took just the time to measure the space, cut the contact paper and voila! There was a learning curve on getting it applied nice and smooth... finally figured out if I kept it "rolled" and then used a ruler to smooth it as I unpealed and unrolled it down the door - it came out flawless! Got the contact paper on Amazon (www.amazon.com/Kittrich-Corporation-Chalkboard-Contact-Paper/dp/B000KKMO90) - was skeptical at first - but it works great! Very cool! I've never seen chalkboard contact paper. What a good alternative for people that don't want to actually paint their cabinets. Thanks for sharing Lisa. I'm dying to try this- it's such a great idea! 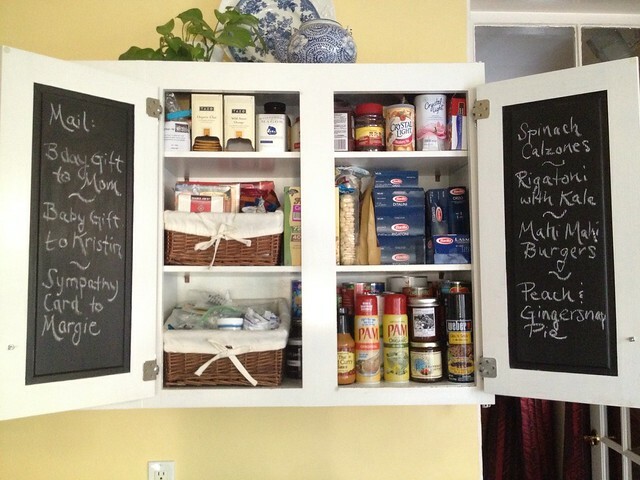 It looks good and it's an awesome way to stay organized and avoid clutter. I have to wait till we're no longer renters though. Yours looks great! Thanks for the pie recipe!!! And holy moly! I'm glad I came to type this because I read a comment below mine and thought, "Chalk pencils? WHat? I must not have read thoroughly..." Sure enough! I am ordering them today. Karin, we may have led you astray. We got our set and they aren't what we initially thought. They do write on the board, but they need warm soapy water to wipe off. Sorry if you already bought them, but don't open them and send them back if you can. :-( We're looking at another option and will update next week. Love this! 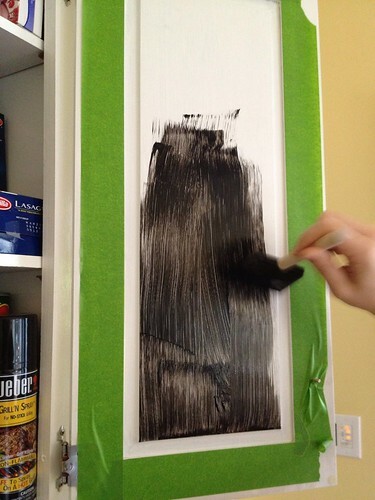 I haven't really been interested in the chalk paint craze - probably because the dust from the chalk makes me sneeze, but I love how you did this and it's hidden. Please update us on how you like the pencils! We are looking into something else though, we'll keep you posted. Have you thought about chalk markers? They're what baristas (clearly, I'm a West Coast girl) and delis use to write up the special of the day and they come in a lot of fun colors. Don't they have chalk marker that are kinda like dry-erase markers? It seems like when I bartended they had a chalk board for special and they used something like that to write on it. Bonus: the colors are more vibrant. Love this idea! I am actually working on this now. Just put the first coat on my cabinet door. How long did you let the paint dry between coats? And I'm glad I came across your post. Used a regular brush for the first coat, and I hate the brushstrokes you can see in it. Will be calling the husband to bring home a foam brush for the rest of the coats!